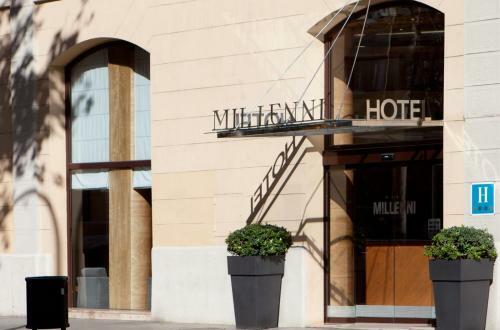 Hotel Millenni is a boutique hotel set 50 metres from Paral.lel Metro Station. It features a small roof terrace with a hot tub and impressive city views. All rooms are stylish and offer free Wi-Fi. Accommodation at the Millenni is brightly decorated. The climate-controlled rooms feature satellite TV and a fully equipped bathroom. A buffet breakfast is served daily and there are several traditional bars and restaurants in the surrounding Raval district. Guests can have access to the gym, the hot tub and the sauna. There are 2 computers which have internet access, as well as a small library with daily newspapers. There is also a lounge area where guests can watch the TV. The famous Las Ramblas are just 10 minutes’ walk from the hotel. The funicular train to Montjuïc Castle leaves from the nearby Metro station. Rate: € 63.00 ... € 128.94; select dates below to get current rates. This triple room has air conditioning. Children must be up to 10 years of age. Rate: € 59.85 ... € 155.25; select dates below to get current rates.